The other day she said that we should create a wedding website together. She explained that it’d be a special way to capture the day and also help keep us organized during the run-up. “A wedding website?” I said. Now, during my time reviewing website builders, I’ve seen many platforms offering wedding style templates but until I did a little research on the subject, I had no idea how big of a thing it is nowadays. The more I thought about it, the more it made sense and so with my knowledge of website builders, I already have two or three in mind but I want to dig a little deeper to see what else is out there on the market. Rather than me simply creating a generic list of wedding platforms, think of this list as my own shortlist and I’ll be reporting my findings for each builder. This is what I do day in, day out only this time, it’s much more personal. I sincerely hope, it’ll save you hours of work. After all, you have plenty on your plate right now planning your big day right? As I said above, the more I thought about the idea, the more I liked it and I quickly came up with reasons why we should go with it. I’ve listed them below and you may find another use for the site that you haven’t yet thought of. #1 Tell your story as a couple: Not everyone at the wedding will know all of the intimate details of how you first met and your journey together since. This is a great opportunity to sit down as a couple and type out your story for your family members and friends to share. You could dedicate a separate page to this on your site called “our story”. #2 Itinerary of the big day: This way, no one will have an excuse to be late! Don’t skimp on this, walk through the day and note down every detail such as what time you’ll wake, what time the make-up artist will arrive, what time you’ll leave the house, the time of the ceremony, the duration of the photos, and time of the reception after. “Are children allowed to the ceremony”? “Can I bring a plus 1”? “Is confetti allowed at the venue”? “What time does the reception start”? “What food and drink will be offered”? #4 Allow your guest to RSVP through your website: Some of the website builders listed here will have specific RSVP features where your guests can visit your site and let you know whether or not they can attend. For the platforms without this feature, a simple customized contact form will work just as well. #5 Keep track of the madness: It goes without saying, that you’ll probably be dealing with a lot of different people and businesses on the run up to your special days such as the church or venue, florists, make-up artists, photographers, car rentals, cake makers, and the list continues. Keep track of all these people along with contact details and figures on a page which you can keep private. #6 Add a map of the location: We’ll be getting married in church and to be honest, it’s in the middle of nowhere! I can only imagine the fun we’ll have on the day with guests trying to find it. To get around this, I’ll be adding a Google Map to our site so guests know the exact location and it wouldn’t hurt for you to do the same. #7 Blog about updates or changes: By adding a simple blog to your site, you could create a new “post” each time you wish to make an update, a change to your plans, or even a funny story. These posts will usually appear in date order and a link to your blog from the main menu will help people stay up to date with the latest news. #8 Showcase your beautiful photo’s and videos: Whether you’re hiring a professional photographer, having a friend do it, or simply leaving the guests with disposable camera’s, all of the pictures can be collated after the wedding and uploaded to a gallery along with your videos. Up until now, this site has mainly been about preparation and organization, this is the most exciting part as this is where you can treasure the joy and happiness of the day forever. I know this may sound glaringly obvious, but it’s not enough just to print the website address at the bottom of the invitations and have done with. Instead, tell people when you see them. Failing that, call them, text them, email them, plaster it all over your Facebook wall if you have to, just make sure people see it! One idea we had is to collect as many addresses as we can of our guests and then we’ll physically mail them a postcard which will include our website address. 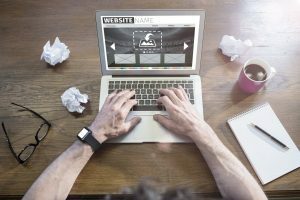 So, Which Type of Website Builder Should You Use? There’s no shortage of website building platforms out there and you definitely won’t be stuck for choice. The trouble is, with everything you already have to do, the last thing you need is to spend days or even weeks trying to master a platform such as WordPress which this site is built on. Don’t get me wrong, I love it and it’s one of the most versatile platforms available but it’s not something you can really get to grips with overnight. Even as a WordPress user myself, I wouldn’t use it for my own wedding site. Instead, I’ll be looking at simpler options which my Fiancee can simply log into and update the site with minimum fuss. There are plenty of them out there and they make creating and maintaining a website a whole lot easier and the best part is, you don’t have to know anything “techie” such as coding or hosting as they take care of all that for your behind the scenes. Okay, now we’re getting into the good stuff. In the list below, you find a mix of generic website builders such as Wix, Weebly, and Squarespace and then a couple of specialist wedding platforms thrown in such as Say I Do and the Appy Couple. The more generic, versatile website builders will usually have a small selection of wedding templates and add-on features allowing them to capture some of the market. The upside is, they usually have tons of customization features allowing you to create a unique wedding site. The more specialist website builders may seem like the obvious choice as many of them have the required tools built in. The problem that I’ve found in general though, is that these platforms aren’t anywhere near as customizable and can look rather generic. The best thing to do is to try a two or three from the list below and see if you can find the right one for you. With around 11o million users spanning the globe, there is little doubt that Wix is one of the industry “big-guns” and can adapt very well to wedding sites. 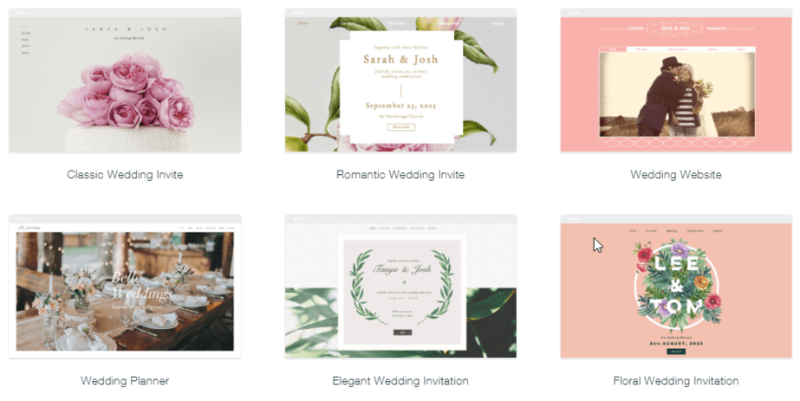 Wix has over 500 industry-specific templates and 20+ of those are focused on marriage and couples not to mention their range of special add-on features (Apps) that can help turn your static site into a fully functional wedding showcase and planning tool. 20+ wedding design templates to get you off to a flying start. Wow your guests by creating a digital invitation and allow them to easily RSVP through the email or directly on your site (Wix ShoutOut app). Add a gift registry to your site so guests know exactly what you’d like for your new life together. Easily upload photos to a gallery to display and treasure special moments from your big day. Allow guests to leave comments directly on your site. Wix offers a free website option. Free website contains ads and some features will be restricted. If elegance and wowing your guests if what you’re going for, Squarespace can help you create a wedding site that’s head and shoulders above other website builders. This platform is ideal for couples with good quality photos to really make the most of it. Price: 14-day free trial available. $12 per month basic plan. 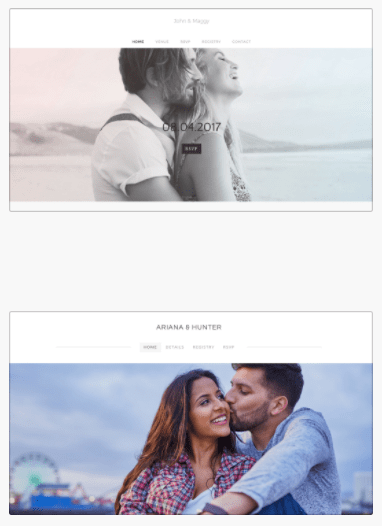 6 great quality wedding style templates. Create wedding registry to help guests choose that perfect gift (Zola integration). Create a wedding album with a gallery and show off your photos and videos to friends and family. Ability to create a form an allow guests to RSVP directly through your website. Quickly add a blog for updates before and after the event. Add map and text widgets to display times, and location of your big day. No free website option, (14-day free trial only). Slightly steeper learning curve than Wix (above). Say I Do is the first specialist wedding builder on the list and one of the lesser mentioned during my own research. After spending some time inside the platform, it definitely has a unique charm and is packed full of tools to help you quickly and easily create your wedding site. Build your guest list along with dietary requirements and then arrange your seating plan. Save on photography fees by allowing guests to upload pictures directly to your site via Instagram. Make it easy for guests to RSVP on your site. For the less internet savvy, you can do it for them. Control whether a particular guest is allowed to bring a plus one to save any awkward moments on the day! Currently, no way for guests to leave messages. No way to upload videos. Website customization is limited beyond colors and fonts etc. I came across a few glitches such as randomly being signed out of my account. Nothing major, just a little annoying. Probably my favorite specialist wedding specific builder out of all the ones I’ve come across. It’s just a shame that it doesn’t come with a free trial as I can imagine it putting people off as most website builders usually come with a free trial at least. I should also point out the Appy Couple is the most feature-rich wedding platform on this list. A wide range of beautiful wedding-specific templates, choose between a single or multi-page website. Your chosen design is automatically rolled over to your main site, app, and invitations etc. Create an app for your guests to download to their smartphone. Create guestlists and choose who’s invited to which event. For example, ceremony, reception, wedding breakfast etc. Get notified each time someone RSVP’s in real time. Easily send email updates to your guests and collect their physical addresses. Upload your beautiful photos to your site and allow guests to do the same. Add a gift registry and give people a helping hand as to what to buy you on your special day. No free trial, there isn’t a way to try it out before you take the plunge (excuse the pun). You won’t be able to stream music to your site without third-party add-ons. Some templates are only available on the higher priced plan. If you’re looking for the easiest way to build a very simple wedding site without all of the bells and whistles, then Weebly could be the one for you. When it comes to my own site, I’ll probably create it due to my experience. However, if my other half decides she’d rather take over the reigns, then I’d highly recommend Weebly to her purely for its simplicity (depending on our requirements). Any of the templates can easily be transformed into a wedding theme by uploading your own text and images. Add a contact form and allow your guests to RSVP by adding custom information. Add a Google map to show guests the location. Add a gallery and upload your photos and video to capture your day. Add a comments section allowing guests to wish you well. Create a separate page and transform it into an itinerary for the day. Not really focused on weddings although templates and features can be easily adapted to cover the basics. 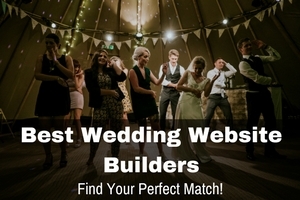 When it comes to wedding website builders, there really isn’t a right or wrong choice. It simply boils down to how much control over the look and of your site you want, as well as how many features you require. My best advice is to test out two or maybe three from the list above and see which one works best for you and your partner. It’ll save you time in the long run rather than diving in and finding out in a week or two it doesn’t have the features you require. Finally, I’d like to say huge congratulations on your engagement and wish you all the best for your big day. I’d love to hear about your wedding plans, so feel free to let me know in the comments section below as well as any questions you may have about anything we’ve covered here today. I tried out Say I do, Weebly and Appy Couple on your recommendation. I landed on Say I do because it was the easiest and most straight forward. It also had the best RSVP process. I have had a couple of my guests mention that they found it great too. Thanks for this review, I dont think I would have found Say I do without this site! Hi Emma, thanks very much for taking the time to share your experience. I still haven’t got around to building my own site yet (our weddings the middle of next year) so I’ll keep Say I Do in mind! Thanks again for stopping by and I wish you all the best on your special day! next post: Can Blogging Really Help Your Business or is it a Myth?